We are proud to offer in-hospital radiology for the convenience of our clients and patients. X-rays are frequently helpful in arriving at a diagnosis. Not only can x-rays identify broken bones, they can be used to detect heart enlargement in cardiac disease patients, they can locate the source of back pain, they can assist in the workup of patients with abdominal discomfort, and they can spot bladder stones. If your pet is likely to become highly stressed or painful during the x-ray procedure, we offer safe and gentle sedation options to make the experience more pleasant. 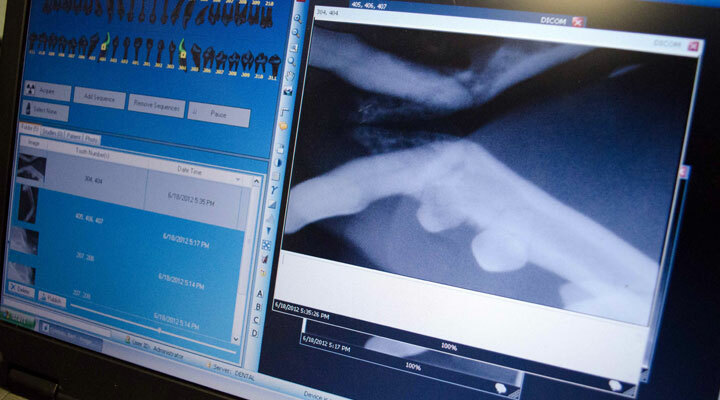 Our x-rays are processed quickly, with our Digital Radiography System. Digital Radiography allows improved image quality, computer based image enhancement, easy storage and transmission as well as the ability to view results immediately and give the client our interpretation the same day. We also offer specialized dental radiography with our most up to date dental equipment for your pets specific needs. In more challenging cases, we offer a second opinion on your pet’s x-rays provided by specialists at a referral centre in Calgary.